Toxicity: Store bought products are non-toxic. Expected symptoms: None expected, possibly minor stomach upset and/or loose stools. What to do: Give your child a drink of water to wash the play dough down to the stomach. 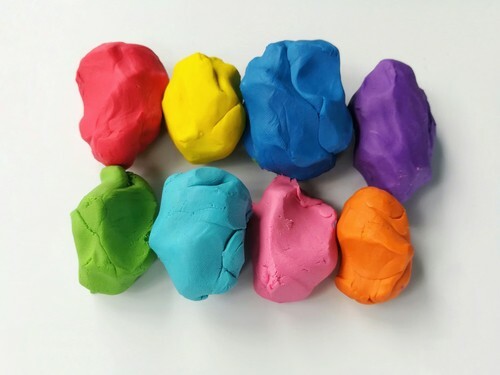 Play dough is easy to make and is a fun family craft. It can be made with ingredients you probably have in your home, but the safety of the homemade play dough depends on the ingredients you choose to use. Common ingredients include a starch-based binder (such as flour), table salt, boric acid (inhibits mold growth), soap, oils, fragrance and color. Play doughs may contains wheat, which could cause an allergic reactions in those sensitive to wheat gluten. Some play dough recipes contain a large amount of salt. If a young child eats a large amount of the batch, they may be at risk for more serious symptoms and it would be important to call the poison center immediately. It should be made clear to a child using play dough that this is not food and should not be eaten. It could be a choking hazard if put in the mouth, but symptoms are unlikely if it is swallowed. If a large amount is ingested, a minor upset stomach or loose stool may occur. If you find your child eating play dough, do not panic. Take the play dough away from them, wipe out the mouth with a soft, wet cloth and give them some water to drink. If problems start or you have questions, call the Missouri Poison Center right away at 1-800-222-1222. The poison center is open all day, every day for poisoning emergencies and questions.